4th of July in Chicago expects huge chunks of people from different corners of the town. The celebrations take place on a grand scale with performances, fireworks, live telecast, food carnivals, parade, and more. The town also plays patriotic music in the background at the Navy Pier area. People look up to this event to thank and pay their homage to the brave soldiers who fought for them. 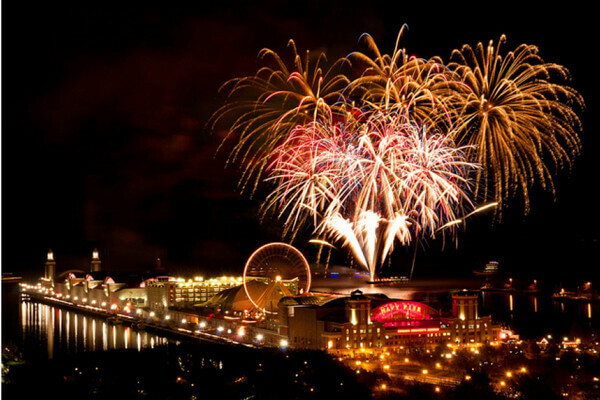 4th of July Fireworks Chicago begin from 9 PM. The view from the town is spectacular with colorful sky. You can enjoy these extraordinary moments either by visiting personally or by watching it on your little screen through the news channels. For spotting the fireworks, visit areas like Ohio Street Park, Millennium Park, Belmont Harbor, and Clarence Buckingham Memorial Fountain. All these places give you breathtaking views of 4th of July fireworks at night. 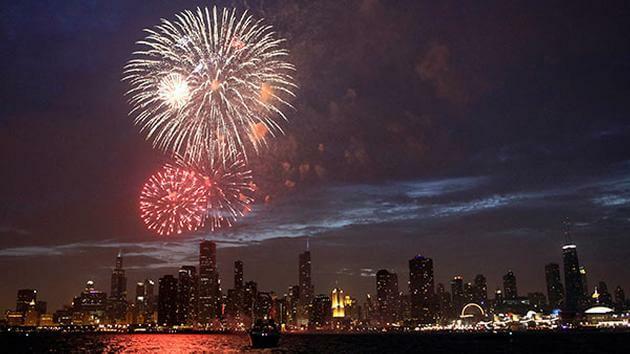 4th of July Chicago Events bring back your patriotic feelings. Visit the Millennium Park for a perfect eventful day with friends. It could get too crowded due to the spirit of Independence Day, so reach much before and reserve your space. Watch the gorgeous Chicago’s architectural beauty from Clarence Buckingham Memorial Fountain. It’s an amazing scene to watch the live fireworks and enjoy live music. The place arranges for some lip-smacking food and game activities for groups. If you wish to avoid the crowd and yet enjoy the Independence scene, rush to the rooftop of Chicago’s Athletic Hotel. It offers you panoramic views from the top with lots of activities planned every year for its guests. 4th of July Chicago Parade is magical to view from Navy Pier. A historic view of sailing ships takes place on this special occasion. Large ships of Chicago sail through the Navy Pier. The Northwest Fourth Fest hosts carnival rides, music, craft fair, and a huge parade organized at Sears Centre Arena. Attend the warm and friendly event at Union Park followed by an impressive parade. It’s a three day festival that begins from 1st of July and lasts on 4th of July. Do not forget to click pictures to share on social media and let your friends know your patriotic moments in Chicago. Share the article with your friends and help them plan their 4th of July too. Article last re-published on June 25, 2018.